When it comes time for a home remodel, renovation, or any other kind of home improvement project, it can be difficult for homeowners to decide whether or not they want to hire an interior designer. This is understandable, considering that you’re already pouring a decent amount of money into your newly renovated home. However, this kind of investment simply isn’t worth it if you don’t hire the right people for the job. From architects and contractors to interior designers and interior decorators, each of these roles has an equally important part in ensuring that your home remodel truly reflects your unique vision of a dream home. At Rinehart Design Group, we are recognized for our impeccable attention to detail and one-of-a-kind luxury home designs, making us one of the best interior design companies in the area. That being said, here are a few reasons why it’s worth it to hire an interior designer to bring your home improvement ideas to life! Contrary to what many homeowners think, hiring an interior designer can save you a lot of money on your home remodel. This is because a seasoned interior designer will know how to best use your space, and with the best brands, materials, features, and appliances, which means fewer returns, repairs, and mistakes. This is especially true when it comes to major decisions, like deciding what kind of built-in entertainment center, home office, kitchen island, or fireplace works best with your home design, because there really isn’t room (literally) to gamble. Homeowners who come up with their own home design ideas instead of hiring an expert typically end up spending hours — if not days — doing research on different types of flooring, room layouts, furniture, and the list goes on. An experienced interior designer will be able to make all these decisions for you with your vision in mind. 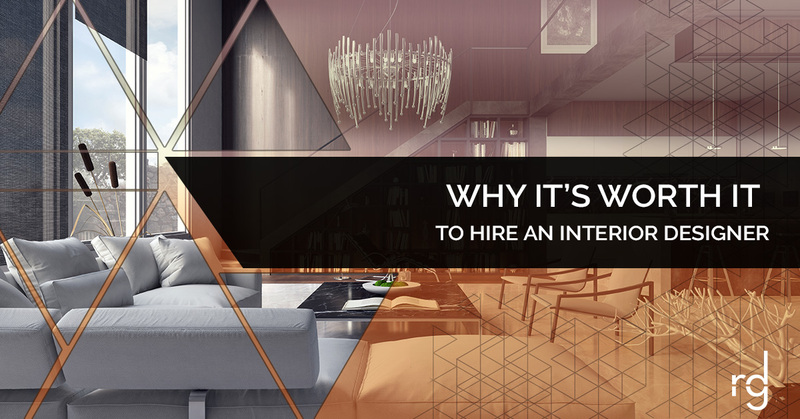 That’s why the best interior designers take the time upfront to meet with you and get an in-depth idea of what exactly your dream home entails. Then, all they have to do is apply their expertise and get to work! Maybe you’re the best DIY home designer you’ve ever met, but when it comes to bringing a specific vision to fruition, it takes a professional — that is, if you want great results without breaking your budget or piling on way more responsibilities than you could ever get to. That’s where we come in. Our interior designers have more than two decades of interior design experience and specialize in creating luxury home designs. Ready to get started? Contact Rinehart Design Group to use our interior design services in Florida, North Carolina, Chicago, or Atlanta!